IS YOUR SKIN ALL YOU’D LIKE IT TO BE? Don’t make the mistake of putting more attention on the latest hairstyle and hot makeup tips than you do on basic skin care. We all want a glowing complexion! With the emphasis on cleansers and moisturizers – and without a doubt, they are vital skin care steps – let’s not forget that even the best of them need to be coupled with their essential partner: TONER. WHAT DOES TONER DO? Toner removes any traces of oil or makeup missed during cleansing. It also soothes, smooths and even helps repair the surface of your skin, diminishing blemishes and minimizing redness and inflammation. Not only that – and this is crucial – toner balances your Acid Mantle. WHAT IS THE ACID MANTLE? Simply put, the Acid Mantle is a film of amino/lactic acids and oils protecting your skin from bacteria, dirt and other environmental pollutants that contribute to premature aging and irritation. BUT I HAVE DRY SKIN – ISN’T TONER ONLY FOR OILY SKIN? Toner is for ALL skin types! Just make sure you choose an alcohol-free toner and if you have sensitive skin, there are toners made just for you. The CUCUMBER isn’t just for salads and gazpacho anymore. It’s even making its mark in Margaritas! But today we find it in skin care – and for good reasons. This fruit – that’s right, it’s a fruit – is chock-full of water, plus Vitamins C & K, Magnesium, Potassium and even Protein. 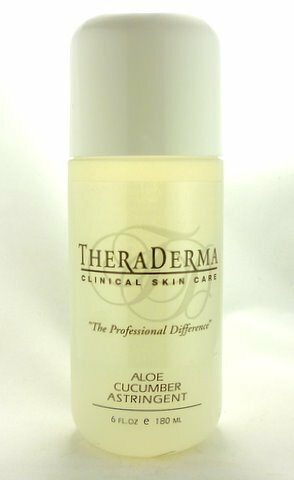 THERADERMA ALOE CUCUMBER ASTRINGENT TONER iTs an alcohol-free, calming astringent toner that tightens pores and smooths the appearance of your dry or sensitive skin to give it a finer, softer texture. EUCALYPTUS is familiar to all of us as the perfect remedy when we have a cold or cough …. ahhh that wonderful, bracing scent! But eucalyptus oil is also known for its anti-bacterial properties. THERADERMA EUCALYPTUS ASTRINGENT TONER has a combination of ingredients formulated to keep your pores smooth, clean and healthy by exfoliating surface dead skin cells and balancing the skin’s ph level. GINSENG has ancient roots in health care and today is known to boost the immune system, fight infections and is used to improve concentration, memory and physical endurance. Even a cup of Ginseng tea is recommended for its naturally occurring chemicals that are present in the root. But what about our skin? 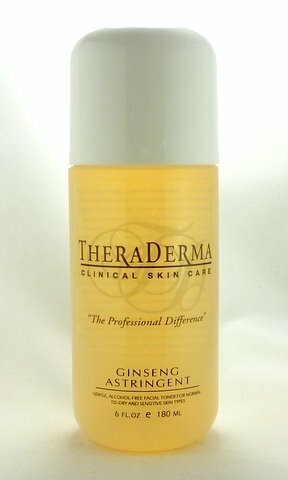 THERADERMA GINSENG ASTRINGENT TONER is ideal for many skin types because it removes surface dead skin cells to clean deep into the pores to remove residue dirt, makeup and bacteria with its oil-free formulation of Glycolic acid. Whichever toner you choose . . …. Enjoy its subtle scent as your cotton ball glides over your skin to give your cleansing routine the finishing touch …. refreshed and ready for your serum and moisturizer. Feel confident, knowing you are giving your skin the very best Theraderma has to offer! This entry was posted in Anti Aging serum, Dry Mature Skin, Oily-Acne skin, Skin Care and tagged anti aging, Cleansing skincare, dark spots, dead skin cells, exfoliate, fine lines, hyperpigmentation, wrinkles on October 7, 2017 by admin. SKINCARE MISTAKES — What NOT To Do! Linda Hong created HelloBeautifulFace.com with one goal in mind: providing a trusted resource for every skin care need. I’ve enjoyed facials coast-to-coast, but Linda Hong delivers the most heavenly, therapeutic facial I have ever received. She has healing hands that are gentle and yet strong when they need to be (ah that neck massage!). The quiet atmosphere and soft restful music are ideal and I love her products. My skin felt like silk afterwards. I’ve decided that a Linda Hong Facial is not an extravagance, but a necessity.Thanks, Linda!